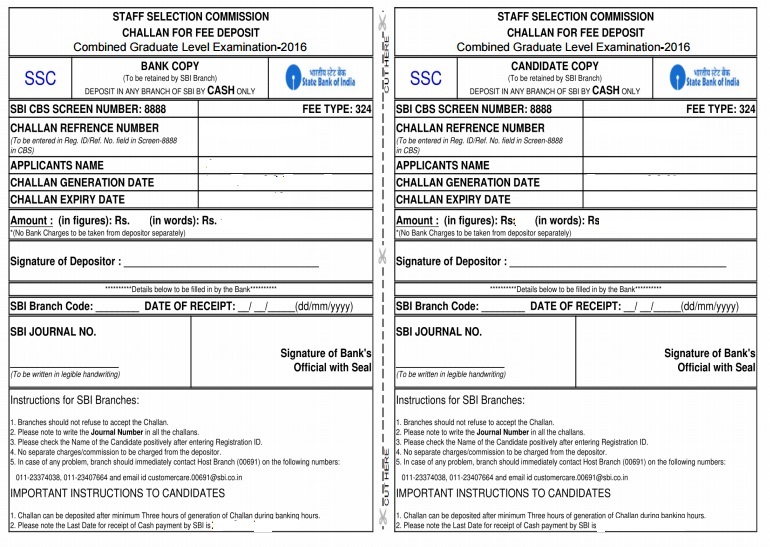 Staff selection commission(SSC) has invited application for various posts in 2016. The Online form will be available from 13th of Feb, 2016 and close on 24th March,2016. In order to simplify the process of filling of application for various examinations in SSC, and to make it more convenient for candidates, Jagranjosh.com has come up with some important instructions, while candidate used to fill the Application form. Staff selection commission(SSC) has invited application for various posts in 2016. The Online form will be available from 13th of Feb, 2016 and close on 24th March,2016. Jagranjosh.com has come up with some important instructions, while candidate used to fill the Application form. 2.) This website contains this part namely, Registration Part,Instructions to candidates, Apply Part. e. Enter Text: - In this Textbox, A candidate is required to fill the code appended in the right corner of this block. It is only for testing that form is handled by a human being, not by robot/web browser’s preset data. d. Nationality:- It indicates to the nation in which you are born and hold the citizenship.It is Indian by default. If you belong to any other country, then select others. It is compulsory to fill. i. Type of Disability: - If you are Visually handicapped(VH), Hearing handicapped(HH), Orthopaedically handicapped(OH), then choose the corresponding entries. After filling filling all entries correctly, You can press on Enter Button, then again a pop-up on the top of Web Browser will show asking for the final confirmation. If you found all entries as per your consent then you can click on the OK Button. Following Window will pop-up. 5. As you proceed to this step, your Provisional Registration number and password are provided to you. Hence, an Online form filling process will be terminated and you are redirected to the Main Page (http://ssconline.nic.in/ssc/). 6. 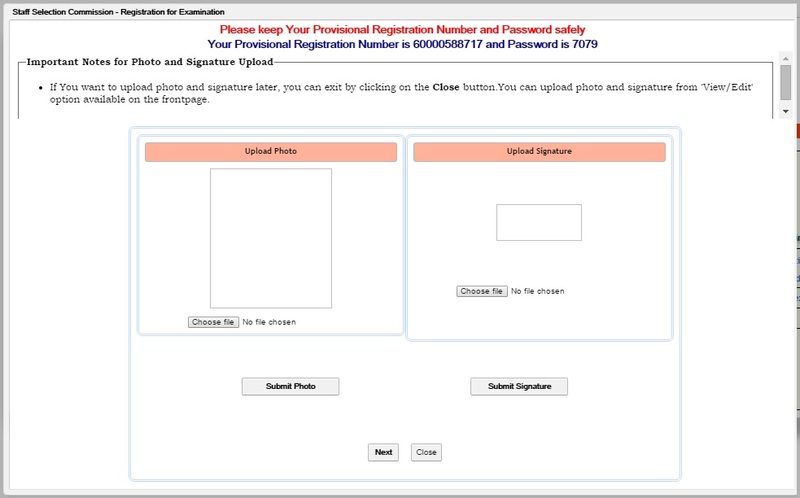 After registration, with Provisional Registration number and password, you can login into the main profile to complete the Part-II. Login can be done, under the Apply Part of the Main Page. Under this Section you have to enter your provisional registration number and password obtained in Step 5. 7. In this form, You have to fill the information that is essential for future verification at the time of Interview. Therefore, be attentive at the time of filling these text boxes. a. 1 & 2 Examination center and code: - When you click on this dropdown text box, there are several cities of several states along with the city code. Choose the examination center as per your convenience. b. Fee exemption claimed: - If you want to claim fee exemption, then check on Yes Button, otherwise Check on No Button. c. Whether Ex-Serviceman? 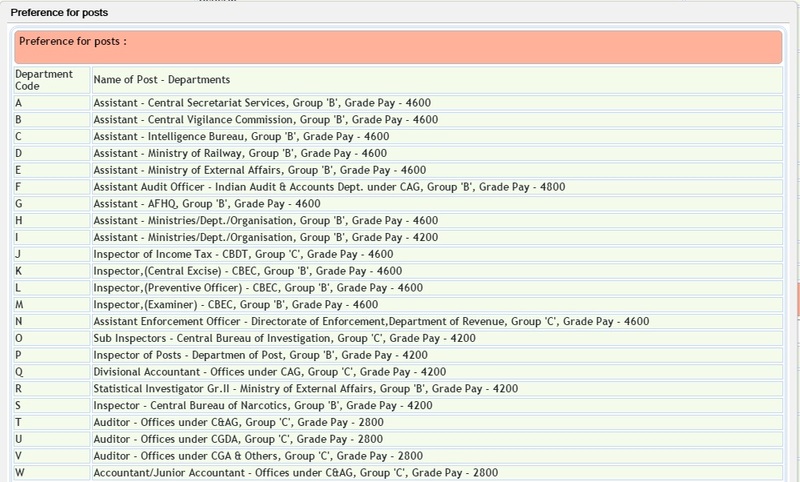 :- If you had worked in any Government Department then You can check on Yes button. Otherwise, you can go with No radio button. d. If, ExS, Whether seeking reservation? :- If you have checked Yes button in step(c.) then this field is mandatory to fill. Under this option, reservation for ex-servicemen is asked. If you want this, then click on Yes, Otherwise, go with No button. e. For Ex-serviceman – Length of Service (in Years) :- In this text box, you have to fill the served period in the particular organization. f. Date of Discharge: - You are asked to fill the date at which you have left the your previous organization in the format of dd/mm/yyyy. g. Whether PH: - This is for physically handicapped candidate. If there is any disability, then check on Yes, otherwise No. h. If yes, indicate code: - If you have chosen Yes in the previous option, then fill up the code. i. Whether seeking age relaxation : - It is a mandatory field. If you are eligible for age relaxation check on Yes button. Otherwise, go with No button. j. Age (as on 01.01.2016) : you’re not asked to fill this box. It is system generated age which is calculated on the basis of date of birth filled by you. Preference of Posts: - Under this section, there are 30 blank boxes in which code for the desired posts are to be filled as per the given details in the table. This table can be retrieved by clicking on View Details. And the table looks like this. In any case, if you want to reset the filled choices, then you can click on the Reset button. l. Are you applying for the posts of Statistical Investigator Gr.II Compiler? :- If you want to join as Statistical investigator, then you are supposed to check on Yes Button, otherwise, Choose No Button. m. Do you possess EQ for the posts of Statistical Investigator Grade II/ Compiler? :- Here EQ stands for Essential Qualification. If you have a degree related to this field, then you can Check on Yes button, otherwise, on No button. n. Are you applying for the post of AAO? :- AAO means the Assistant Audit officer. If you are going to appear for this, then check on yes, otherwise, go with No button. o. Do you posses EQ for the posts of AAO? :- It is the same as we have done in step m.
p. Whether you belong to religious Minority communities as per Govt. orders? :- it is default entry filled by you in the part-I registration. q. If VH/Cerebral Palsy candidate, whether Scribe is required? :- if there is any such disease exist, then go with Yes, otherwise check on No button. r. If Yes, indicate medium: - under this text box, choose English/ Hindi as per your convenience. s. Aadhar Card Number : It is also system generated text area which is completed in Part-I registration. t. Qualification Details (Start from Graduation): - under this section, you are required to fill the essential educational details starting from the graduation to the above degree level. i. 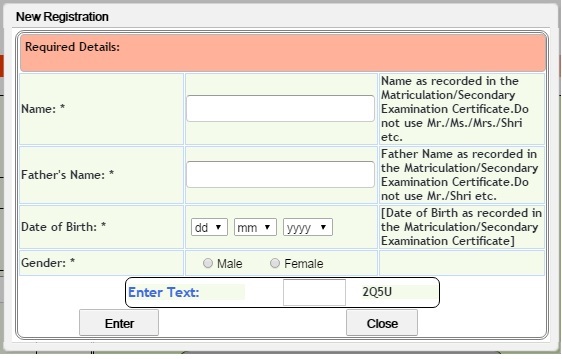 Educational Qualification:- Under this text boxes, you are required to fill the name of degree earned by you. ii. Subject:- in which subject, you have attained a degree. It is to be filled against the corresponding Educational Qualification. iii. Percentage (%) of Marks: - you are asked to enter the obtained percentage of marks in the respective degree up to two decimal numbers. iv. Medium: - in this category, there are three options in the drop down list, namely, Hindi, English & others. You have to choose the medium of your study. u. Details of Work Experience/ Govt. Service rendered :- it is comprised of the following five entries. i. Name of the Organization(s) :- Fill up the name of employers to whom you have worked for. ii. Designation:- Fill the designation that is given by the employer to you during the service period. iii. Nature of Duty: - write the brief description of your work & responsibilities performed in the company’s premises. iv. Period of service From (mm/yyyy):- Fill the month and years of the service initiation. v. Period of service To (mm/yyyy):- Fill the month and years of the service termination. v. Contact Details Form: - under this section, Contact details are retrieved with the following information. i. Postal Address: - write the mailing address in the capital letters at which official communication can be performed time to time. ii. State: - Fill it with the state in which mailing address is located. iii. Pincode: - it is a 6 digit unique number allotted to the cities by the Indian post office. w. Declaration: - it is comprised of the confirmatory sentences and responsibility of the information given by you. Check on the I Agree button. x. Enter text: - Enter the system generated text in the text box for confirming that all details are filled by a human. 8. In this step, You have to fill the following entries. - Fee Exemption claimed: - if you fall under the category of fee exemption, then you can check on yes Button, otherwise, Go for No Button. 9. This is a downloadable Challan which can be submitted at any SBI branch on any working day. In case of online payment candidate will be redirected to Bank site with various payment option as follows. During payment, due to network problem if candidate face any problem he/she has to wait for 48 working hours for the settlement of payment. After completion of payment procedure, candidate may take a print out of their filled application form by logging in Apply/ Print option on the default page. Previous Article Score more in SSC CGL Tier I 2016 with GA section!